Posted on February 12, 2012 December 15, 2018 by catherinedaze	This entry was posted in Fashion, shopping, Style and tagged coat, sewing, shopping, Style. Bookmark the permalink. Most gorgeous coat ever! What an amazing job. Yours definitely has the edge! Wow, it looks great. I am tempted by the short version too. Awesome! I love Rick Owens too. Your version of the coat looks so much better than the pattern cover, why did they underplay the fullness of the skirt? I think that’s what makes it. I love your coat, by the way! Wow look at that snow…. hope the boiler didn’t go on the blink! 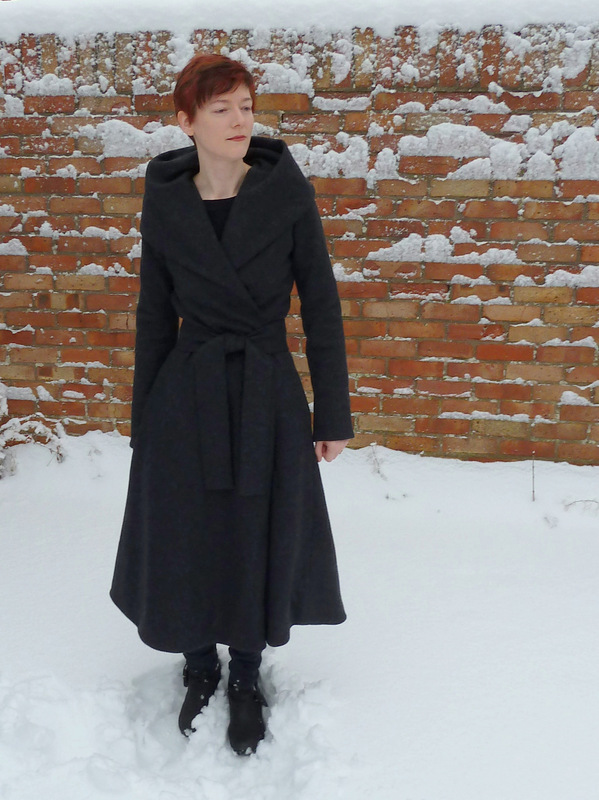 Fantastic coat too and how ‘clever’ of Rick Owens, Vogue and fate to provide. I agree that warm ears are very important and your ears will indeed be warm and dramatically stylish too. Perfect. lovley, lovely coat, Catherine. It’s just beautiful! Well done. It looks amazing and judging by the snow at your feet, a timely wardrobe addition.